Preheat oven to 375°. Scrub and pierce potatoes with a fork; place on a microwave-safe plate. Microwave, uncovered, on high 15-18 minutes or until tender, turning once. When cool enough to handle, cut a thin slice off the top of each potato; discard slice. Scoop out pulp, leaving 1/4-in.-thick shells. In a large skillet, heat butter over medium heat. Add peppers, mushrooms and red onion; cook and stir 4-6 minutes or until tender. Stir in salt, pepper and 1 cup pulp (save remaining pulp for another use). Add eggs; cook and stir until eggs are thickened and no liquid egg remains. Stir in 1/2 cup cheese and 1/4 cup sour cream. Spoon egg mixture into potato shells. Place on a 15x10x1-in. baking pan. Sprinkle with remaining 3/4 cup cheese. Bake 10-12 minutes or until heated through and cheese is melted. 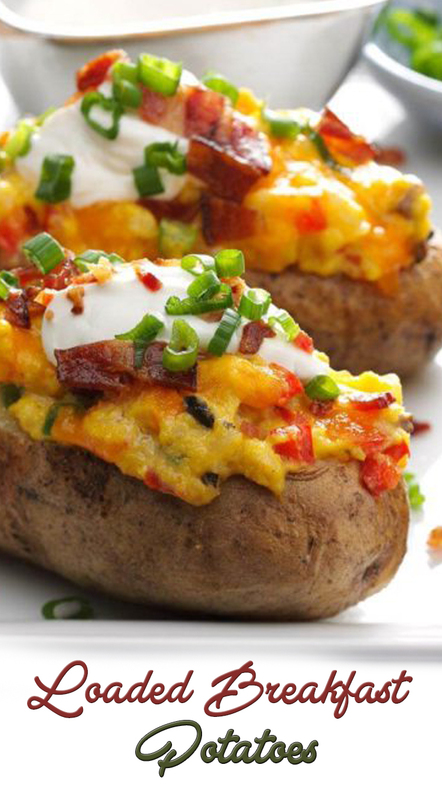 Top with remaining sour cream; sprinkle with bacon and green onions.